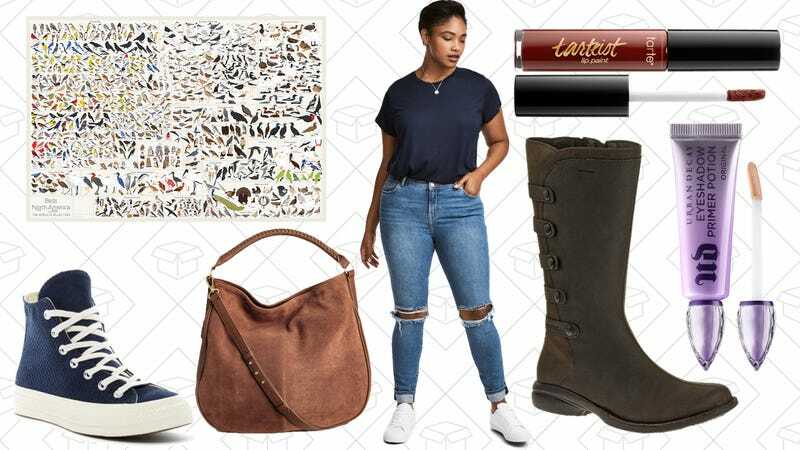 Converse sale at Nordstrom Rack, H&M’s Labor Day Sale, Sephora’s Weekly Wow deals, an exclusive Pop Chart Lab discount, and more lead Thursday’s best lifestyle deals. Sephora isn’t known for their discounts and deals like other retailers, but they’re trying something new this year with their Weekly Wow deals. Every Thursday, Sephora will drop a bunch of deals and offers for one week only. This week, it’s Urban Decay’s Primer Potion for $14 (in Original, Anti-Aging, Eden, Sin, and Caffeine), Benefit They’re Real Mascara, and Tarteist Lip Paint (in Matte, Glossy, and Quick Dry). They’re already going fast, so you should probably get over there. Merrell may be most known for their quality hiking footwear, and you can get a piece of that for less. Right now, they’re running a Private Sale with three styles of footwear for men and women, just in time for the hiking weather to start. Each style has two colors to choose from as well, and even the leather boots for women are waterproof. H&M’s fast-fashion is even faster and cheaper, with their huge sale going on right now. Get up to 60% off women’s, men’s, kids, and home goods, starting at just $5. It’s silly not to at least take a look. Pick up some classic sneakers during Nordstrom Rack’s Converse sale. Chuck Taylors are marked down to as low as $25, but the sale has a ton of other styles included as well. Nordstrom Rack has split them up into men’s and women’s, but there are a lot of unisex styles, so I recommend doing some exploring. Typical leather belts aren’t ideal for outdoor adventuring, so if you want hold up your pants with something a little more rugged, we’ve got the first ever discount on Abl belts. These belts are constructed from a firm elastic, which means you can adjust it to fit perfectly (and loosen it after a big meal), rather than conforming to the inch-apart holes that BIG BELT wants to foist upon us. The buckle is also pretty slick, made of injection-molded carbon fiber, which is super strong, and won’t set off a metal detector. Abl has never offered a discount on their belts before, so this is a great opportunity for our readers. Just pick your color and size, and use code KINJA6NE at checkout to save 20%. You probably already got your Bean boots from last year and are ready for whatever 2017 throws at you (weather-wise, at least). But if you need to replace a few things, or stock up on some trans-seasonal styles, L.L.Bean is giving you 25% off any order of $50 or more with the code LABORDAY. Stave off the winter weather in the best way you know how. Summer is almost over and ASOS wants to make sure your wardrobe is prepared for the fall. Right now, over 500 of their styles are 50% off, with everything from shoes and accessories, to denim and dresses included, no code needed. It’s going to be hard to let your shopping bag stay empty. There must be something in the air, because J.Crew Factory has had major discounts lately. Use the code DELISH and take an extra 50% off all clearance items, which is insane seeing as practically everything is already marked down under $100. Maybe hold off on cleaning out your closet until after this sale is over. Add something a little weird to your wardrobe with Valfré’s End of Summer Sale. Use the code LATER and grab 30% off select full-price styles, and an extra 30% off sale clothing, iPhone accessories, bags, and more. If you want to own something from a badass, women-run LA brand, look no further than Valfré. Now if you’ll excuse me, I have to whittle down my cart to less than 10 things. 25% off everything with code GIZMO25. If your spring cleaning doesn’t involve revamping your home goods, what are you even doing? Add some awesome infographics to your walls with 25% off sitewide at Pop Chart Lab. Get everything from the Connected Characters of Seinfeld to every single bird in North America. Enter the code GIZMO25 at checkout to see your discount. And if you need an attractive and easy way to hang your new posters, the 25% also works on poster rails and map corners. Some days, you just need to make a mug of coffee and get going. Others, you need a full pot. Luckily, this top-selling $49 Hamilton Beach can do both. This once went as low as $40 on Amazon, but that brief deal aside, $49 is a great price. If you hate the Star Wars prequel trilogy more than Anakin Skywalker hates sand, you can get a Blu-ray combo with just episodes IV-VI for $28 today, an all-time low. 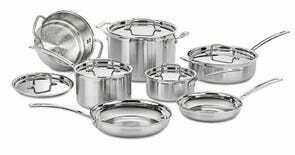 Cuisinart’s Multiclad Pro cookware uses the same steel and aluminum triple-ply construction of All-Clad pans, but at $180 for a complete set, you can actually afford to buy them. That’s an all-time low for this collection, which rarely dips below $200. If you’re still using the $10 pans you bought when you moved into your first apartment, these are going to blow you away. Felicia Day’s top-selling memoir is just $2 on Kindle today, and a great buy for anyone interested in internet culture. 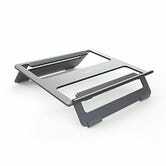 There are lots of aluminum laptop stands out there, but this is the only one I’ve seen that can fold completely flat to fit in a backpack, and prop up your laptop at two different angles. Plus, at $23 (with code N4KT9PZS), its also cheaper than most alternatives. Win-win.